Andy Kaufman and Orson Welles both liked tricking people; Welles as the man behind War Of The Worlds and F For Fake, and Kaufman as a comedian who tended to derive more pleasure from confusing audiences with layers of nested realities than in making them outright laugh. So it’s slightly disappointing, if still weirdly apt, to watch these two titans of 20th century misdirection meet in person, and then mostly just talk about Taxi. That’s courtesy of a 1982 clip from The Merv Griffin Show—recently posted by YouTube user Sebas Tabany—that saw guest host Welles interview Kaufman glowingly, and almost exclusively, about his performance on the ABC sitcom. “One of the best things I’ve seen in a long time,” said Welles, who also called the series “one of the other shows that has kept television from being a criminal felony.” For his own part, Kaufman—who was apparently right in the middle of his crusade as a would-be professional wrestler—mostly just seems starstruck at Welles’ praise, letting the garrulous Hollywood legend do most of the talking. 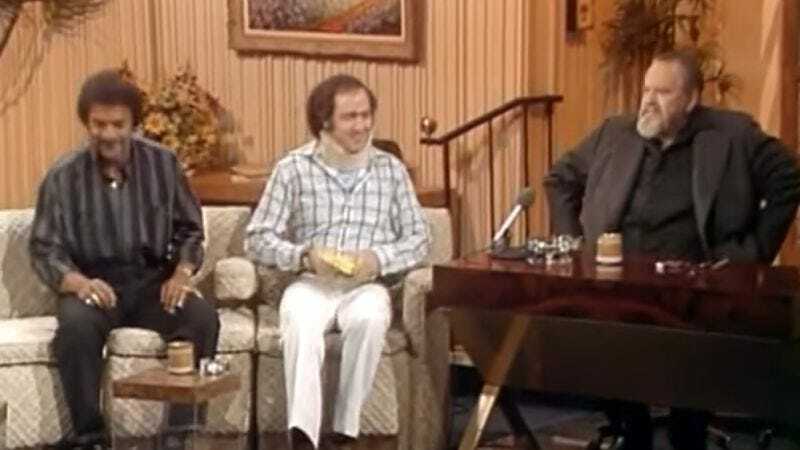 Even if both men are a little nervous in their roles as talk show host and guest, it’s an interesting little time capsule of the early 1980s, with a few winking nods to both men’s obsessions with shifting identities—including Kaufman’s alter-ego, Tony Clifton, which Welles dubs “metaphysics” with a laugh.